New York : Harcourt Brace Jovanovich, 1982. 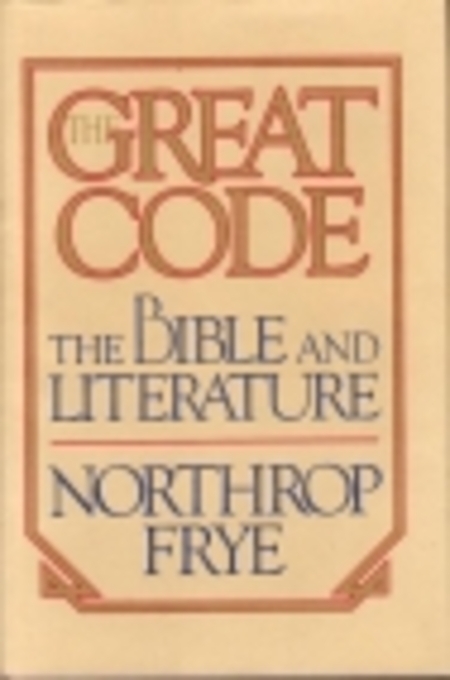 While carefully distinguishing the Bible from the various categories of secular literature, Northrop Frye applies the techniques and perspectives of his work in literary criticism to it in The Great Code. (The title phrase, like most of Frye's, is a quote from Blake.) The book works in an exploratory fashion that proceeds from the atomic level of language, through myth and metaphor, to the continuities involved in biblical typology. Then he traces the same arc in reverse, to integrate what he had previously analyzed. Frye makes no pleas on behalf of supernatural agency or religious institutions. He discusses the Bible as a textual curiosity, and works to demonstrate the worth it can have for thoughtful readers, as well as the contributions that it has made to the mental infrastructure of our civilization. In the denouement of this volume, the first of several he would eventually write about the Bible, Frye cites Nietzsche and Feuerbach, and muses about magic and sexuality. As always, he is a lively and elegant writer. "The Great Code" really re-configured the way that I conceive of the Bible as a literary document. After two centuries of historical criticism (or narrative criticism as it's called when applied to the Bible), it is refreshing to see a whole new interpretive methodology which looks inward at the Bible, instead of trying to test its significance by how well it correlates to something outside of itself. And that is the central thesis to Frye's argument - that the Bible is a unified mythology, replete with its own literary devices, that hardly needs confirmation from history or archaeology to successfully tell the story (mythos) that it tells. Because of this, the book has been the target of a number of appropriate historicist critiques, all claiming that one can't cut wholly separate the work of literature from its social and cultural context. Although these criticisms aren't all fair themselves, as Frye even considers the structure of certain metaphors (like the ubiquitous flood myth) modulate themselves repeatedly via literary transmission into new texts. The first part of the book consists of a highly condensed theory of language which Frye employs in the second half. I found this part just as useful, yet often elided in critical reviews. According to Frye, his own ideas are highly influenced by Vico's "Scienza Nuova" which posits the idea of a cyclical theory of language wherein each human epoch uses language in a unique, irreducible way. In his tripartite interpretation, there is the hieroglyphic stage in which words have the pure energy of potential magic, the hieratic stage in which words begin to reflect an objective reality of a transcendent order, and the demotic stage, where prose continues its subordination to "the inductive and fact-gathering process," and seems to be the stage we remain in today. If this evolution has taken us full circle from feel the pure immediacy of metaphor, how are we supposed to read the Bible (whose language is, of course, one of pure metaphorical immediacy)? Nietzsche said that God had lost his function, but Vico (and Frye in turn) might have replied that the Bible is simply entombed in a lost part of the cycle, inaccessible and unable to be interpreted by the demotic. His neo-Viconian theory of language goes some way in offering a theory for the vulgarism that so often takes the name of Biblical interpretation: "With the general acceptance of demotic and descriptive criteria in language, such literalism becomes a feature of anti-intellectual Christian populism" (45). The second part begins the literary criticism as one would more formally recognize it. According to Frye, the Bible can operate independently precisely because it functions and maintains its own body of rhetorical devices, including metaphor, and type, antitype, and archetype. "We clearly have to consider the possibility that metaphor is not an incidental ornament, but one of its controlling modes of thought" (54). Metaphor and trope become the sole measure of the Bible's inner verbal consistency. The "type" and "antitype" are essentially import; he construes the entire Bible as a series of musical call-and-response gestures between the Old and New Testaments: the Resurrection is the response to the Old Testament Promised Land, the baptism in the River Jordan is the New Testament's answer to the Old Testament's Red Sea. He also integrates a number of other complex typologies, including the Creation-Incarnation-Death-Descent to Hell-Harrowing of Hell-Resurrection-Ascension-Heaven motif and a nomenclature of types, including the "demonic," "analogical," and "apocalyptic." This universe - multiverse, even - of complex metaphor, meaning, and type are the ones that we continue to recognize, read, and struggle with today, which accounts for the fact that myth goes a long way in exploring who we are and what we do as a community. Notice how Frye deftly bypasses any theological or strictly philosophical concerns. As Frank Kermode would comment almost a decade after the book was published, "Just as he exiled questions of value from the Anatomy [of Criticism], he exiles from his Biblical criticism questions of belief." When was the last time I read a challenging theology book? Heck, when was the last time that I read a book that took me more than two days to finish? ("Spelling Power" doesn't count) "The Great Code" is the book that was central to my wife's master's thesis. She brought it along with her to China in case anybody wanted to examine her credentials and read her thesis. So far, nobody has said word one about it. But it did give me one more book to read. Actually, I erred when I referred to it as a theology book. In "The Great Code", Profesor Frye examines the Bible as a work of literature. He's interested in what story it tells and how that tale is told. He doesn't wrestle with the question of whether the story is true or not, or how one should apply it to one's life. It was a different way to look at Scripture and I found it interesting to take a gander from that perspective. A lot of the thechnical terms went over my head, but overall I enjoyed the read. I'm glad I checked it out. It is a book that interprets the bible quite aptly, I found it stimulating of profoundly spiritual thoughts. It is quite a dense read however, and for light readers a dictionary might be necessary. For Christians keep some of Mr. Frye's views loosely and you'll get an awful lot out of this book. This is a book about the literary nature of the Bible from the perspective of a literary critic. It is a challenging read, but well worth the struggle. One objective the author had for this book was, "What follows attempts to extract the introductory and prefatory part of what I have to say about the Bible's relationship to Western literature" (p. xxi). I am half way through the book, and currently feel that this has not been achieved very thoroughly. In general, the author has given more of an explanation of how to read the Bible, as opposed to its relationship to Western literature--but again, I'm only at the mid-point. I have a great appreciate for the author's presentation of how to read the Bible; i.e., that we should understand the phases of language development and where various parts of the Bible fit into that scheme. However, there are times that I feel I am reading a "history of religions" presentation rather than a literary critical view. Granted, the broadest sense of literary criticism does encompass various aspects of historical criticism. This volume is not intended to be a reading informed by faith, yet it is extremely helpful to a person of faith who desires to read the Bible from a perspective that does not require one to suspend reason, as if reason and faith were mutually exclusive. Frye created a good environment for the discussion of mythology and apocalypticism, particularly with his presentation of the idea of the myths of deliverance. This material is a good primer for a fresh read of the book of Revelation.